How's the U.S. economy doing? If you're a glass half-full type, it's easy to point to the fact that the economy is expanding again and unemployment is at a six year low. Gas is back under $3 a gallon, the stock market is at an all-time high and this year's job gains are on track to be the best since 1999. America is certainly better off than it was during the financial crisis, and the nation looks a lot stronger economically than Japan and Europe. But there's a glass half-empty side of this economy, too. Wages aren't rising for most Americans. A middle class family is actually bringing home the same income as it did in 1995, and millions of people want full-time jobs but are stuck in part-time positions. There's no denying the rich are getting richer and the rest are stagnating. The fact is there is truth in both sides -- the result of a slow-burn recovery from the worst financial crisis in generations. 1. Lucky to be employed. On Friday the government reported another strong month of job gains. The unemployment rate is 5.8%, not far from what most economists think is typical rate of around 5% when the economy is humming along. But the improving number masks the fact that the U.S. has 2.9 million people who have been out of work for half a year or more. 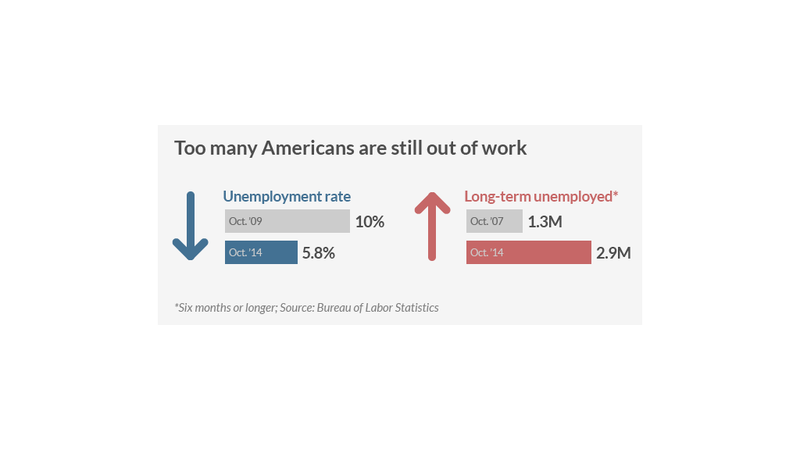 That's double the number of long-term unemployed than before the recession. Even more troubling is that the U.S. has over 7 million people who are working part-time but want full-time employment. Americans are spenders. We like to buy things and that powers our economy. But people can't make purchases if they don't have money. That's why it's so worrying that U.S. wages aren't getting any bigger. 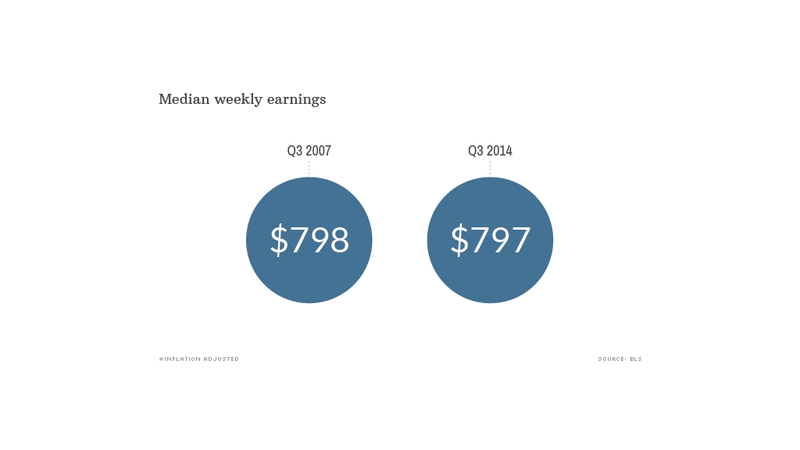 Wages today are about the same as they were just before the recession. In the past year, wages went up about 2%, but that is just ahead of how fast costs have been rising so the gains are basically canceled out. 3. More gains went to Wall Street than Main Street. 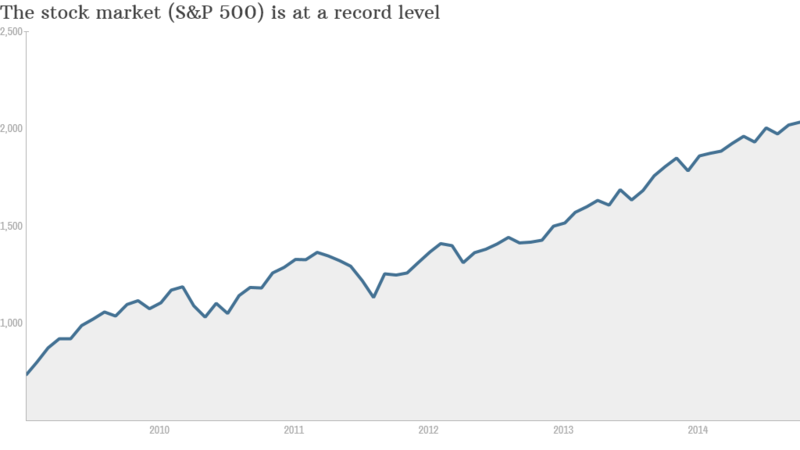 The one area that has bounced back since the end of the recession is the stock market. It bottomed out in March 2009 and has been on an incredible tear ever since. The S&P 500 -- the benchmark index that has a lot of funds that mimic or track it -- is up nearly 200% since that 2009 low point. But the catch is that only half of Americans have any money in the stock market. So all those gains have only exacerbated the "have versus have not" economy. Wealthy whites are the most likely to own stocks. And since the rich own more stocks, they benefited more.